This beautiful buildings is situated on a hilltop in Aliki offering panoramic view of the Aegean Sea. 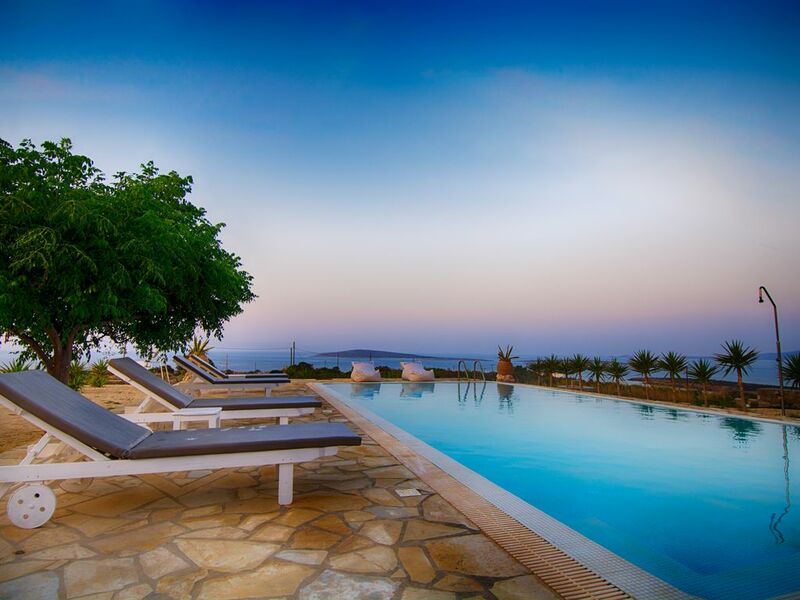 It is the ideal place to enjoy that view of Antiparos, Aliki and the neighboring islands. The main building has three bedrooms , three bathrooms, two kitchens and a big living room with all the facilities and private pool. The second building has two bedrooms , one sofa bed ,one bathroom ,a kitchen with all the facilities and private pool . The third building has one bedroom ,one bathroom and a kitchen with all the facilities ,two sofa beds and private spa hydromasaz . It is the perfect choice for people who wish to relax, rest and enjoy the luxury that villa Paros Afrodite offers. The villas extends in an area of 10 acres offering visitors the comfort they need, as laurels surround it. Ideal location for a wedding event, a christening party and of course of a wedding stay. The flight from Athens to Paros lasts about 30 minutes. Paros Airport is 2 km away from Aliki. There are daily ferry services linking the port of Piraeus to Parikia. Traveling by ferry takes 4.5 hours, while with the high-speed 2.5 hours. The Port of Parikia is 10 km from Aliki. There are regular bus services from Aliki to Parikia. During the summer period the services are hourly. When you get off at the bus stop at the booth of St. Nicholas in Aliki, follow the road to After 250 m, at your right hand you will see our villa at the top of the mountain. Location: Aliki is a seaside resort on the south coast of Paros. Originally it was a small fishing village but now it has become very popular with tourists. There are many restaurants on the beach with traditional Greek cuisine, cafes and bars. You can reach Most beaches in Paros on foot (Aliki, Piso Aliki, St. Nicholas, Tripiti and Faragas). During the summer months you will be able to participate in several cultural events such as the resurrection of St. John the Klidona on the 23rd of June and a festival on the 6th of August. Aliki village is the most famous village in Paros island with nice beaches and restaurants Aliki is a seaside resort on the south coast of Paros. wonderful location, great host, fine house but under equipped kitchen though. Also, I think there is a total of 4 kitchen(ette)s. The consequence is that (inside) there is no real area to seat or cook for a big group. In all, I would recommend it taking the above into consideration. We were a group of nine friends that rented two small villas each having three bedrooms. There was a mixup between what we thought we had rented and what the owner said we rented but our gracious host, Arsenis, made it right and we had a great time. The next time I rent a villa I will contact the owner before renting to confirm the number of bedrooms that we are renting. The first of the two villas is of newer construction with a small plunge pool and is devided into two units each with a fully equipped kitchen and beautifully decorated. I rate this villa 5 star and would highly recommend renting it. The second villa was quite a bit older and was also fully equipped but the bathrooms and kitchen could use some updating. They were adequate but it was hard not to get the one bathroom wet when showering. This villa had a large outdoor pool and beautiful well equipped terrace (lots of seating) and outstanding views. This villa I rate a 4 star but could easily be five star with a few updates. Renting both villas was perfect for our group and I would recommend it for a family as well as a group of friends. We loved the location which was walking distance to two beaches, shopping, and restaurants. We had a wonderful time exploring Alyki as well as the island. Our host Arsenis gave us excellent guidance on restaurants and things to do. Many thanks to Arsenis for helping to make our visit memorable. The view is spectacular and the buildings were great. Arsenis responded to questions quickly and helped out with car trouble and other advice. You do need a vehicle if you are staying there, and set a plan for your arrival before you land (no wifi at the Paros airport). Meeting at the Galatis Hotel just down the hill from the house would be smart. The villa is in Aliki village in Paros with fantastic views and a great hospitality. Just a few minutes from the beaches and the little port. The pool is great and the view amazing, the staff was always there for all of our questions. We choose this villa for our friends weeding and we didn't regreated. The villa is amazing and the view stanning , the owner is very welcomed and the cleanning wonderful. We will go there again . A must stay here!!! We will come back. Aliki of Paros is a lovely summer resort at the south part of Paros island. Originally a fishers village, it has now days became very popular to visitors. There are several restaurants on the beaches, with traditional Greek food cafe and bars. The most beautiful beaches of Paros are on walking distance (Aliki beach ,Piso Aliki, S.Nikolaos, tripiti,pounda beach and Faragas. Aliki beaches are ideal for sea-sports friends, where there is always the chance between deep or shallow waters, busy or desert little creeks for swimming and diving. Also you can visit the famous scorpios museum and you can have your yoga lessons at the most famous teacher of yoga. Distances: Paros port 10km, and airport 2Km, from tavernas and super markets 100m, bus station from-to all Paros 20m from the hotel, 20m from doctors and the pharmacie, 100m from childrens ground.